Sunset Blvd at the West Gate of Bel Air. Sunset Boulevard is a long road in west Los Angeles. It stretches 24 miles (39 km) from Figueroa Street in downtown (central) Los Angeles to the Pacific Coast Highway in Pacific Palisades at the Pacific Ocean. Part of the Boulevard, called Sunset Strip, passes through Hollywood. The boulevard is at least four lanes wide for all of the route. Car accidents are not uncommon due to the lack of a central divider on most sections. The road also has difficult curves and hills that a driver cannot see over. Sunset often has more cars on it than were planned for. It is worn, and has cracks and potholes. Traffic on Sunset is often slow, especially during the rush hour. But when traffic is mild, Sunset is a fast thoroughfare because it has few (and short timed) traffic lights in the western part. Even at rush hours, cars move without waiting, as the lights are well spaced and timed. This is the 1½ mile (2.4) km strip running through West Hollywood. 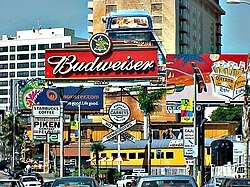 The Strip is well-known; it has boutiques, restaurants, and nightclubs that are part of the entertainment industry. It is also known for its trademark array of huge, colorful billboards and is a 'hangout' for rock stars, movie stars and other entertainers. Sunset Strip was the location of a popular TV show 77 Sunset Strip (1958–1964), starring Ephrem Zimbalist Jnr. Many young stars made an appearance in the series. Sunset Boulevard gave its name to a famous 1950 movie of the same name, starring Gloria Swanson, William Holden and Eric von Stroheim. This page was last changed on 30 April 2017, at 14:55.